Ryanair bases in Dublin, Barcelona, Stansted and Shannon have joined colleagues at over 50 other bases in rejecting the airline's proposals for pay increases and bonuses in exchange for giving up annual leave to alleviate the staffing crisis. It is understood that pilots at 55 of Ryanair's 86 bases have now turned down the deal - raising the prospect of conflict looming between management and staff at the airline. Earlier, Chief Executive Michael O'Leary said the company will hand pilots at some of its largest bases a €10,000 annual pay rise on top of a €12,000 bonus offered this week to those who help the airline alleviate the pilot shortage. Mr O'Leary warned that he was prepared to unilaterally cancel leave for pilots who have four week blocks of holidays allocated for October. Pilot sources said pilots were apoplectic at this suggestion, describing it as counterproductive - as it would encourage even more to defect to competitor airlines. Employee Representative Councils for a number of bases are seeking a negotiation process to deliver new, better contracts by 31 December. They have given Mr O'Leary until tomorrow to react to their "counter-offer". However, Mr O'Leary has ruled out any change to the airline's contractor model based on hiring a significant number of staff through agencies or alternative arrangements rather than as direct employees. Pilots were offered the bonus in exchange for working an additional 10 days to plug a shortage that last week forced Ryanair to cancel over 2,000 flights in September and October. Pilots at London Stansted, Dublin, Frankfurt and Berlin have now been offered an additional €10,000 a year, Michael O'Leary said. Similar offers may be made at other airports, but that will depend on whether those bases have a surplus of pilots, he added. Speaking at the company's AGM in Dublin today, Mr O'Leary also said that he could not rule out axing more flights, but added any further cancellations would not be linked to current pilot roster problems. He said he "cannot guarantee there won't be further cancellations, but there won't be any further cancellations as a result of this rostering issue". At today's AGM, Michael O'Leary also accused unions outside Ryanair of orchestrating discontent among pilots - but warned that the airline would not shift form its position of refusing to recognise unions. He said he was happy to meet Employee Representative Councils to discuss any issues they may have, but warned that staff who engaged in "blue flu" or other actions would not get promoted. Shareholders at today's AGM also heard that Ryanair would have completed training for a further 120 pilots within two weeks, and would recruit almost 500 new pilots over the next six months. Mr O'Leary said that while there were reports of pilots rejecting the bonus scheme offered for giving back annual leave, staff had already volunteered to give back 2,500 days. Earlier, the Ryanair CEO apologised to shareholders for the cancellation of flights which has disrupted over 300,000 passengers. He acknowledged that the airline had got things wrong, but defended the growth in passenger numbers at the airline. Mr O'Leary said he took personal responsibility for the operational mistakes that led to the cancellations and for the poor communication of the disruption. He told shareholders that the six weeks of cancellations, which he previously admitted was a "mess", has cost the airline about €25m. Asked about the pilots' rejection of the company's bonus scheme to encourage them to give up annual leave to address staff shortages, he said the Ryanair may have to take back one week of the pilots' four week block of leave. He said Ryanair was entitled to do this under their contracts. 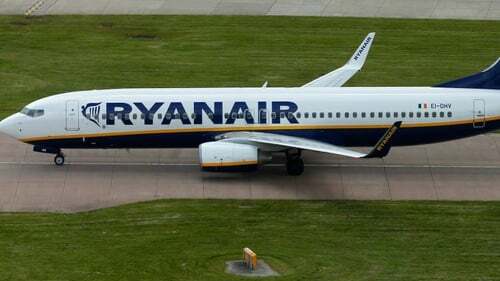 Mr O'Leary said that much of the discontent was fuelled by unions among Ryanair's competitors, and he pledged that the current difficulties would not lead to unionisation at the carrier. He also forecast that there would be aviation difficulties after Brexit if the UK did not negotiate a deal to replace the Open Skies arrangement. RTÉ News has seen documents which raise the possibility of a work-to-rule by pilots, which would significantly worsen the current disruption to flights at the airline. Pilots at the airline's bases across Europe are understood to be in discussions over such a move. Last week, Ryanair revealed that it was shelving up to 50 flights everyday over the next six weeks. The airline said the cancellations were brought about by the over-allocation of pilots' holidays during a relatively busy period. Passengers have reported problems with the process of refunds and compensation for cancelled flights, saying information supplied by the airline is incorrect and calls are going unanswered. The airline said it was aware of the issue and any customers who were double-charged for seats or hold luggage will be refunded. Ryanair said all 315,000 customers affected by the cancellations received an email on Monday advising them of their flight changes and offering alternative flights and refunds. The airline said it expected to have re-accommodated more than 175,000 customers on other Ryanair flights and to have processed refunds for more than 20% of those affected by close of business yesterday.